Almost half of the electorate believed that Barisan Nasional abused its power to retain Putrajaya, a Universiti Malaya survey has revealed. 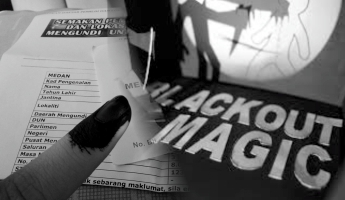 Universiti Malaya Centre for Democracy and Elections (Umcedel) said 46% of voters were convinced that the Election Commission helped the ruling coalition during the May 5 general election. Although PAS knew that it was difficult to defeat Umno in the Kuala Besut by-election and take over Terengganu, it was still a blow to the party when the BN won with a slight increase in majority. Kuala Besut was, after all, a stronghold of Umno. The ruling state government also had an advantage in the by-election, as it was able to concentrate its resources and get close to voters, such as the BN’s announcement of the RM400 million development plan. Kuala Besut voters should not enslave themselves by voting in Barisan Nasional (BN) in return for financial assistance, PKR supremo Datuk Seri Anwar Ibrahim said last night while on the stump for this Wednesday’s by-election. Anwar told some 800 supporters at Kampung Tok Saboh last night that voters should take the opportunity this time to change the political landscape in the country by ensuring a PAS victory in the Kuala Besut by-election. Students are the oppressed and the teaching system is the oppressor because the teacher-student relationship is dichotomous, instead of a single unit together in the search for the end of education. Love. What a loaded word. As simple as what its literal meaning suggests, and as complicated as its many kinds of connotations and expressions. Every soul must have been affected by love, whether we are prepared to comprehend it or not. Some of us might seek to analyse it, while some prefer to simply immerse in its ambiguity. But, “at the touch of love, everyone becomes a poet”, so says Plato. File photo of BN flags put up during the recent general election. Several BN MPs are unhappy that they have not been rewarded for their victory in the polls. Several disgruntled Barisan Nasional (BN) MPs from east Malaysia met veteran lawmaker Tengku Razaleigh Hamzah last night to discuss their positions after not getting anything for their wins in the closely-fought Election 2013. Whether or not the BN actually had a hand in the decision by the ROS not to recognise DAP’s Central Committee is now academic. The DAP will go to the polls with the rocket symbol intact. But even more interesting is the movement that is now sweeping Facebook and the social media. Malaysians, especially Malaysian Chinese, have adopted creative ways to adapt the rocket symbol with that of the white moon of PAS. Most of us are tired of politicians. In a real and honest world a politician is one who represents the people, a very high calling, a noble profession. These are individuals willing to sacrifice much to represent the average person on the street. They are willing to forego their own interests to meet the needs of the many. They are prepared to speak up when injustice is done and to make decisions which benefit the majority of the people. These are the persons we elect, not just the party they represent, but persons of integrity. It was exactly five years ago today that Umno, MCA and MIC suffered their worst electoral result in more than five decades. Although Barisan Nasional managed to stay afloat and maintain its hold on the federal power thanks to Sabah and Sarawak, the outcome in the peninsula was nothing but catastrophic, for want of a better word. By the year 1965, I had completed five years service with the Kedah state government, the minimum period of service for state scholarship holders. I was therefore free to leave the service. I applied for a post at the Ministry of External Affairs and was accepted. I wanted national and international exposure. My last post in Kedah was as Secretary of the Sungai Petani Town Council which also involved overseeing all local councils in the District of Kuala Muda. EC deputy chief, Wan Ahmad Wan Omar, told a press conference yesterday that not being able to trace 28 per cent of voters is “normal”. Today, five years ago, Malaysia woke up to a changed political and national landscape with Barisan Nasional (BN) keeping the federal government with just a simple majority but losing four more states to a nascent Pakatan Rakyat (PR) in Election 2008. Can it be said that Prime Minister Najib Tun Razak plans to delay the dissolution of Parliament, thus effectively delaying holding the 13th general election? Is there a plan to delay the general election? All things certainly seem to point to that direction. The dateline is approaching near and Prime Minister Najib Tun Razak is desperate as he knows that the rakyat is waiting anxiously for the polls to be held. When food bags were given out by Prime Minister Najib Abdul Razak at Semenyih recently, it is alleged that there was a near stampede to acquire the goodies. Najib must have felt smug satisfaction at being able to control people like that. One does not want to judge or question why people would demean themselves by pushing others out of the way to receive the goods. Perhaps, the people who grabbed the offerings were poor, and gaining some rice and flour seemed like winning a jackpot. DAP also questioned the logic of giving overseas Malaysian voters only one day to cast their postal votes at their respective embassies. DAP has urged the Election Commission (EC) to remove a newly introduced clause which requires Malaysians living abroad to return home for “a total of 30 days within five years” as a pre-requisite to qualify as a postal voter. Malaysian voters abroad must submit their 1B form to the Election Commission before the Parliament is dissolved for them to be eligible to cast their votes at Malaysian embassies and consulates when the time comes. Otherwise, the EC would not be able to send the specific ballot papers of the voters’ constituencies, the commission’s deputy chairman Datuk Wan Ahmad Wan Omar told the New Straits Times today. Polling on Saturday, March 30? Because of the one-week school holiday in March, the polls will most certainly be held during this time, and the all-defining date that pops up is Saturday, March 30. A number of regular readers of this columnist’s articles have requested for piece on the polls date, so this issue will be tackled here. But first of all, this columnist wishes to say that Prime Minister Najib Tun Razak has just lost a brilliant opportunity to deal Pakatan Rakyat a fatal blow by dissolving Parliament on Jan 14 (just after the KL112 event) for early February polls, which will certainly catch Pakatan by surprise as its leaders are expecting the general election to be held only in March. Najib urges Malaysia’s Christian community to join in the journey of change and renewal for a better Malaysia. Prime Minister Najib Tun Razak today called on Christian leaders to continue engaging in constructive dialogue to improve inter-religious relations in Malaysia. He said that no one should fear constructive dialogue because “we can only respect and appreciate one another more, if we know one another better”. Pakatan to win with 118 seats? A neutral Chinese political analyst who is a friend of this columnist has informed that it is possible for Pakatan Rakyat to win the 13th general election by 118 seats, with BN getting 104. The total number of parliamentary seats is 222. Just the other day, Selangor Umno confidently predicted that it would win 32 seats in the upcoming general election, while an Umno division leader from Kelantan told me that the Barisan Nasional already had 28 seats in the bag. Rafizi claims that Najib has at last come to terms with the impossibility of regaining two thirds of Parliament. Prime Minister Najib Tun Razak has given up hoping that Barisan Nasional will win two thirds of parliament and will announce the election date once he can be assured of a simple majority, according to PKR strategy director Rafizi Ramli. He said Najib had been demanding field reports on voter reaction to every one of his political moves and had finally despaired of reaching his target. Speaking at a forum in Kuala Lumpur last night, the political scientist, who requested that his name not be published, said the Pakatan Rakyat parties did not cooperate well with the Sabah local parties.Pakatan Rakyat is not strong enough to take on the BN in Sabah despite the peninsular-based opposition coalition having gradually made inroads into the East Malaysian state, a political pundit argues. According to Muhyiddin Yassin’s camp, campaigning in December will give BN a strategic advantage, given that the middle-class and Christians will be distracted. Umno deputy president Muhyiddin Yassin’s boys want the general election this year. They are pushing Muhyiddin to pressure Prime Minister Najib Tun Razak to dissolve Parliament by Nov 30. Is March GE too late for Najib? PM Najib has missed his best opportunity to hold the polls in March this year. By next March, he would have lost the element of surprise. All throughout this year, from January till now, it can be seen that Prime Minister Najib Tun Razak has got no clear strategy in regard to the general election. Those in the international community may be forgiven for asking ‘is there a problem with the democratic process in Malaysia?’. In the international arena, our leaders portray Malaysia as a moderate Islamic nation that is built on the democratic principles enshrined in the federal constitution. While the Election Commission (EC) is struggling to make the changes necessary to facilitate overseas voting, South Koreans living in Malaysia are gearing up to vote for their president from abroad for the first time. At the Korea Day Exhibition in the Sunway Convention Centre, Subang Jaya, that ended yesterday, its embassy officials and volunteers set up a booth to register their citizens as absentee voters. The next general election is expected to be the closest fight to form the new Malaysian government. And several seats across the nation are likely to be heated battles with the slimmest of majorities. The Malaysian Insider takes a look at some of these hot seats in what will be an intense election for control of Malaysia. Opposition Leader Anwar Ibrahim and his Pakatan Rakyat coalition are set to celebrate the September 16 Malaysia Day in Sabah and Sarawak. Not only will the resurgent Anwar and top Pakatan leadership sign a historic declaration in Kuching, he is expected to welcome another key Sabah Umno leader to the opposition side of the fence. “Suffice to say that he is the former Sabah Umno treasurer and he will make the announcement himself on Saturday to leave the Umno-BN and join the fight for change in Sabah,” PKR vice president Tian Chua toldMalaysia Chronicle. The opposition leader said Najib’s administration has two laws when responding to violent acts by the ruling party and the opposition. Opposition Leader Anwar Ibrahim accused the Najib administration of double standard when it came to political violence. (Full Downloadable Blueprint link inside) The blueprint aims to adjust and put Malaysia’s education at par with rich economies with focus on critical thinking. Prime Minister Najib Tun Razak today unveiled the National Education Blueprint that will equip students with knowledge, thinking skills and bilingual proficiency, among others. The reforms will be carried out in 11 shifts over 17 years. (Full Downloadable Blueprint link inside) The Parent Action Group for Education (Page) has expressed disappointment with the new education blueprint (salient points), claiming it is “nothing new”. Its chairperson Noor Azimah Abdul Rahim said the preliminary report is merely “re-labelling” the Education Ministry’s responsibilities. “There is no oomph or wow factor. Basically they are rebranding or re-labelling thing that are already the responsibility of the ministry,” she said. The Election Commission today urged all parties who have an issue with the voters list to approach them directly instead of highlighting the matter in the press. The Election Commission (EC) has attributed some of the irregularities in the voters’ roll to “human error”. Taib Mahmud has no legal right to ban anyone from entering Sarawak unless they have violated the Immigration Act or the federal constitution. On Feb 23 this year the Bersih 2.0 steering committee at state level was formed here in Kuching. PKR claims that EC is using legal means to move voters illegally into a different voting constituency. PKR today alleged that the Election Commission (EC) has new ways to manipulate the electoral roll. This new method, they claimed, used the legal means of creating “divisions” (Belah Bahagi) to move voters illegally into a different voting constituency. Armed with printouts of his presentation slides, Ng Chak Ngoon (left) who described himself as a retiree, presented the panel with a graph that showed 222 lines with every one being taller than the other as it progressed. DAP and PKR who are both aiming to contest seats in Sarawak are not worried about overlapping activities. KUCHING: Selangor has pledged to channel its resources, including manpower, to help Sarawak in the coming general election as it is one of the important states that can ensure the Pakatan Rakyat ‘march’ to Putrajaya is successful. Selangor Menteri Besar Khalid Ibrahim, who was here on a visit together with de facto PKR leader Anwar Ibrahim, said people were begining to accept Pakatan. The ‘songkok’ which completes the official attire of the state assemblymen is not a religious symbol as perceived by DAP, says senior Sarawak Minister Aband Johari Tun Openg. Opposition PKR earned itself some brownie points from the ‘ruling’ class when its three assemblymen attended the 10th Sarawak Legislative Assembly sitting in full uniform. Pelagus assemblyman George Lagong is a much sought-after man now – by the media, opposition and Barisan Nasional. The sole independent assemblyman in the 10th Sarawak State Legislative Assembly, George Lagong, is bent on keeping secrets. Since his win in Pelagus in the April 16 state election, he has been as slippery as an eel, dodging questions on, among others, his loyalty to Sarawak National Party (SNAP) and whether or not he will defect. One of the teachings in Sun Tzu’s Art Of War says that what cannot be won by confrontation must be won by stealth. This is very true. And there are many in the Pakatan Rakyat camp who say this typifies their BN rivals. Those who know they may not win the general election by fair means may opt to win by foul means. More than 4,000 delegates thronged the PKR election convention on Sunday, giving Opposition Leader Anwar Ibrahim an extra boost to the morale as he prepares the party and the Pakatan Rakyat coalition for snap general polls widely expected to be called within these few months. The atmosphere contrasted sharply with the PKR congress in November last year, where members were subdued after former FT chief Zaid Ibrahim, widely seen as an UMNO plant, rocked the party with a nasty challenge for the deputy presidency. The demands of Perhimpunan BERSIH 2.0 promote a vibrant and transparent democracy. All citizens, politicians or otherwise, should only support these (not attack them) if they believe Malaysians deserve such a democracy. BERSIH 2.0 believes that Malaysians deserve an electoral system of integrity, strong and independent public institutions and a corrupt free society. It has long been recognised that NGOs play a vital role in Malaysian society. They constitute Malaysian Civil Society and the voices of the people. PKR will launch the Demi Rakyat website today, ahead of a campaign to focus on the economy and social issues to convince fence sitters to lean towards Pakatan Rakyat (PR) in the next general election expected within the year. Screenshot of the demirakyat.org website. A former Sabah chief minister has predicted that Barisan Nasional (BN) will no longer be able to call the state its ‘fixed deposit’ after the 13th general election. Yong Teck Lee said the growing dissatisfaction over the direction of the economy as well as policies affecting Sabah and Sarawak would have an effect on the general election. Mat Sabu in Bukit Bintang – a mission not impossible? Mat Sabu, the newly-elected deputy president of PAS, has a jovial personality which most people find engaging. I have known him personally during my brief period in Parliament, and like many other people from my party, I find Mat Sabu cosmopolitan, open-minded and original in his ideas. He is one PAS MP who is customer-friendly. Take your pick Umno elite, Plan A, B, C or D? The recent PAS party election is seen as a setback for UMNO. Hoping fervently for a possible split between the Erdogans and the Ulamak, UMNO was taken aback at the positive results, which saw a more moderate line-up. Suddenly, in the eyes of Malaysians, PAS has become a viable alternative to UMNO. It was only last month that PAS Kuala Selangor MP Dr Dzulkefly Ahmad made a prediction that the 13th General Election will be held in July and there was even an analyst writing in an online news portal predicting that the election will be held as early as this month. But due to the fluid nature of the Malaysian political scene, these gentlemen have shifted their forecast somewhat. Dzul now sees GE-13 in early September. However, his Pakatan Rakyat colleague Rafizi Ramli is still stickig to July to “err on the side of caution”. It will inconvenience city folk and disrupt businesses in the area, says Umno Youth. Umno Youth lodged a report against the Coalition for Free and Fair Elections (Bersih 2.0) rally organisers at the Dang Wangi district police station today.